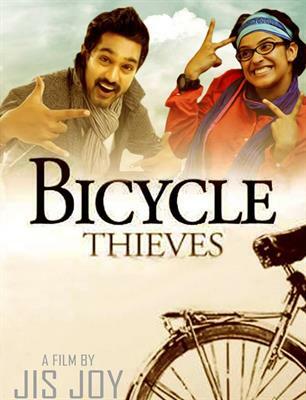 Bicycle Thieves malayalam movie directed by debutante Jis Joy will have Asif Ali and Aparna Gopinath in lead. Produced by Dharmik Films, the story of the movie revolves around the life of a gang of thieves. Salim Kumar, Bineesh Kodiyeri and Rahul Madhav Vijay Babu, Siddique, Jaffer Idukki and KPAC Lalitha will give life to other prominent characters in the movie. Scripted by Ajith Pillai, the 'Bicycle Thieves' will be a complete entertainer creamed with humour and suspense. Actor Asif Ali who has already been branded as young stylish hero is one the peak of his acting career well being associated with a couple of healthy projects. The young romantic hero is all set to keep his presence alive on the silver screen. After wrapping the shoot of 'Pakida', Asif has joined the sets of Jis Joy's directorial debut 'Bicycle Thieves'. Inspired from the character played by Mammootty in the 1990's hit movie, Kalikkalam, the story of his movie revolves around the life of four friends who steal bicycles and sell them for a living. If Kalikkalam was based on the life of a robber, 'Bicycle Thieves' is all about a gang of thieves. Zooming into the story, Asif, an orphan is a gang leader who makes theft albeit with a noble intention. Being a kind-hearted person, he spends a part of his income in helping poor people. Salim Kumar, Bineesh Kodiyeri and Rahul Madhav will be seen in the role of other thieves who keeps themselves close to the character played by Asif Ali. Aparna Gopinath who dons the role of a bank employee makes an influential presence in the life of him. The story pools into the exciting events that happens in the life of the lead pair. Vijay Babu, Siddique, Jaffer Idukki and KPAC Lalitha will give life to other prominent characters in the movie. For the story of Ajith Pillai, Jis himself has lent his hands writing the screenplay and dialogues for the movie. The movie will be blessed with the presence of Deepak Dev who would be showing his talents by setting the tunes. Aparna Gopinath who made her onscreen screen presence with Martin Prakkat's ABCD is expecting to raise her career graph high with the strong character role in the movie. Jis Joy who had already shown his mettle behind the screen as an ad film director is gearing up to create a space in the film industry with 'Bicycle Thieves'. With the shooting already progressing at various locations in Kochi, the movie will reach theatres in November.